Eagle Network Solutions was founded by Kaleb Jacob in Scarborough, Maine in April of 2004. 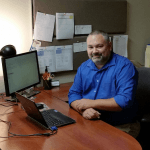 A Microsoft Certified Systems Engineer (MCSE) since 2000, his valuable firsthand IT knowledge and experience was earned through associations with Microsoft Partners in the Wisconsin, New Hampshire and Maine. Knowing that today’s structured Information Systems environments require multiple proficiencies, Eagle Network Solutions has continued associations with many professional partners to provide a full complement of services. Our experienced technical team is diverse in expertise, but focused on business continuity and efficiency. Eagle Network Solutions is your full service network support company. Kaleb Jacob is uniquely qualified to understand the business and network security demands of today’s modern company. A business owner since 1999, he has an invaluable background in Information Technology, sales management, and customer service. He has served on the Board of Directors of two Rotary Clubs and had been a law enforcement officer for several agencies in Maine and New Hampshire. Kaleb enjoys the fast paced and ever changing world of technology, but believes that balance is important for a happy life. Kaleb enjoys the western Appalachian mountains of Maine for fly fishing, canoeing, hunting, ATV’ing, snowmobiling and even making homebrew at his family’s remote cabin with mountain spring water. Kaleb is a Registered Maine Guide in the classifications of fishing, hunting and recreation. He has two children and wife, Amy, who has been key to his success.